Just a few minutes down the same street as the Rijks Museum is Vondelpark and Vondeling Restaurant where we enjoyed free, live entertainment. 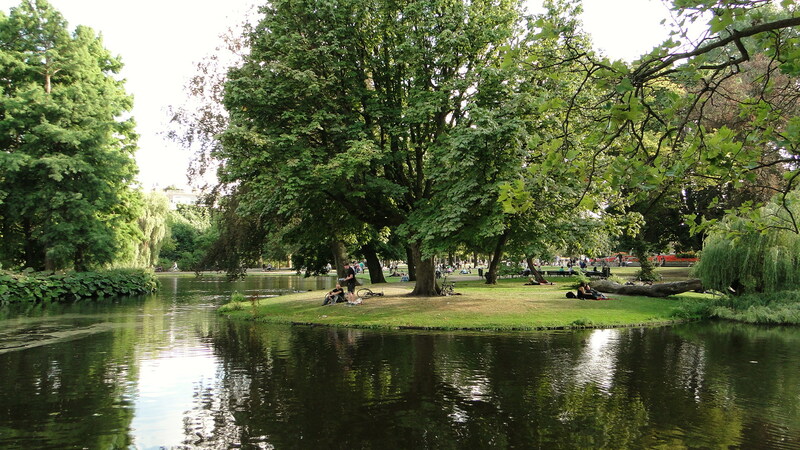 Vondelpark is brimming with locals, bicyclists and tourists alike seeking solace among it’s artful ponds and green space. Sights and sounds of Vondelpark included the aroma of sizzling dutch barbeques, bicyclists, roller-skaters, and the unmistakeable singing coming from the centre of the park. Luckily we followed the sounds of a free outdoor concert on Sunday at Vondeling Restaurant equipped with a bandstand, bleachers and platforms. We grooved to Berget Lewis debuting her album and decided she was Chaka Khan meets Beyoncé. We locked up our bikes and chilled to her wide range of song styles. In Europe, it seems that artists don't have to stick to any particular "sound" which I suppose is something our North American music industry shuns. Free concert goers cannot be choosers. We really enjoyed people and fashion watching. It really reminded me of Central Park in New York City in the summer. 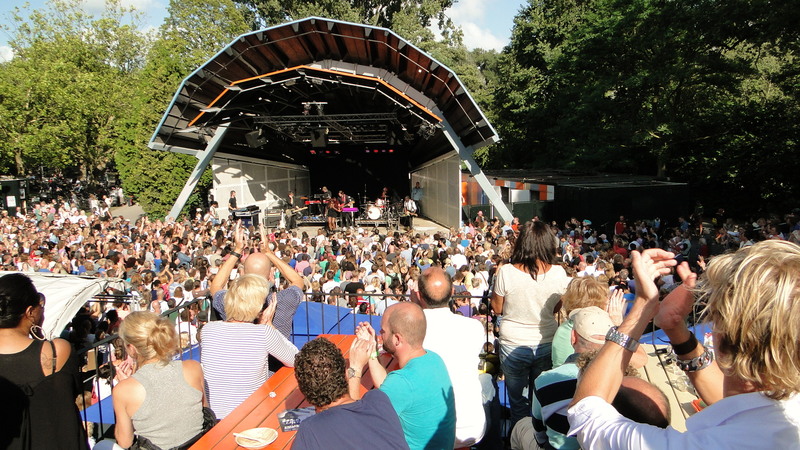 Amsterdam's artistic community and families gather here for a city-park daycation. 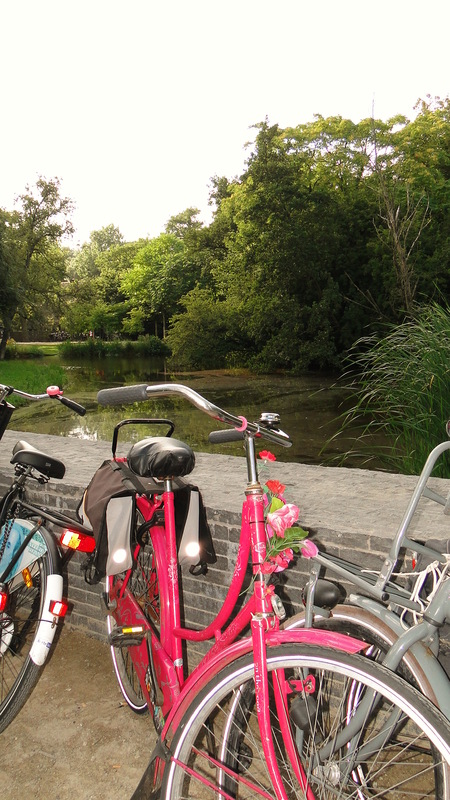 Blending into the local ambiance was easy breezy in Vondelpark and I highly recommend putting it on your list of self-made bike tours of Amsterdam. A few bicycle tour companies to rent and/or take standard bike tours with in Amsterdam, Netherlands are Mac Bike tours, Yellowbike tours, Budget tours and many more less known, but less expensive local bike shops everywhere. I have enjoyed the country bike tour with Yellow Bike tours, and the city tour with Mac Bike tours. In hindsight, Amsterdam has great architecture and is a must ride and stroll. Sometimes the city tours are best done with some helpful advice. However, the city routes haven’t changed much in the last few years, with its staid and unoriginal and un-Dutch visits to seedier parts of town. If you really want to know, the Dutch consider the Red Light District and drug-filled streets to be untypical of their culture, and a self-destructive tourist trap. The misuse of spiritual images to promote drug use is parasitic and anti-culture. That being said, the country yellow-bike tour was very picturesque for me with it’s windmills, farmlands and pancake house. There is so much more to Amsterdam than the conveyer belt mass tours of the city, so here are some ideas to make your own bike/walk/museum/art/concert tour of your own. It would very much please the locals if you discovered the real treasures Amsterdam has to offer to the visiting tourist. Ready-made tours are a great way to meet people but cost a little more. To save money, rent a bike on your own and pick two or three spots with ample flexibility for the unexpected “finds.” I paid nine euros for twenty-four hours and dropped my key off at the front desk of my hotel. All bikes are equipped with one to two industrial locks and I have always opted to take the insurance against theft or damage. Let’s get down to saving money on your bike tour and best tips for skipping museum lines. Most lineups for museums consist of non-ticket holders waiting to pay by debit or credit. So, do yourself a favor and buy your tickets ahead of time for example at the booth near central station. With pre-purchased tickets, skip the line and walk right to the front and cut in to the “ticket holder” line, and sail right in. I have it on good authority, that most museums don’t take more than an hour. Without a lineup, you will cover far more territory if time is limited. Which brings me to this stunning photo of the Rijks Museum grounds. You do not have to be a museum-type to appreciate the surrounding pond, serene grounds and tasteful, modern art in the Rijks backyard. It did not cost anything for us to enjoy this park, without even entering the museum. Archways grace the middle of the building where hundreds of bikes course through the tunnels. 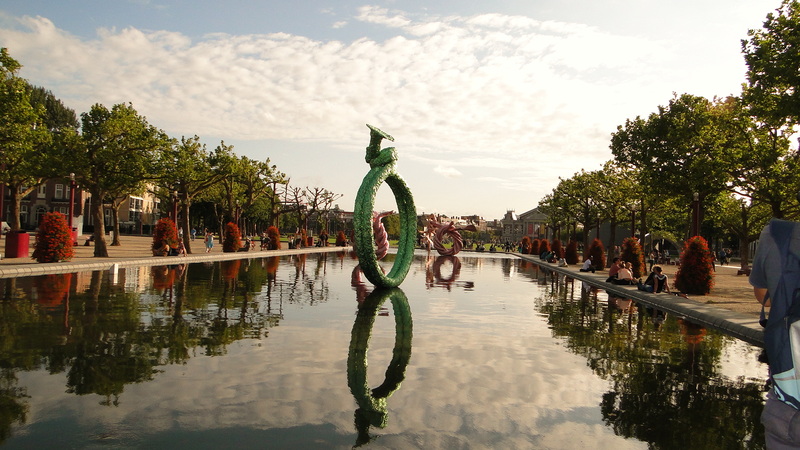 Beyond, a serene pond reflecting “tin-foil” statues of twisted, graceful shapes in pastels are waiting to be discovered. This place took my breath away! 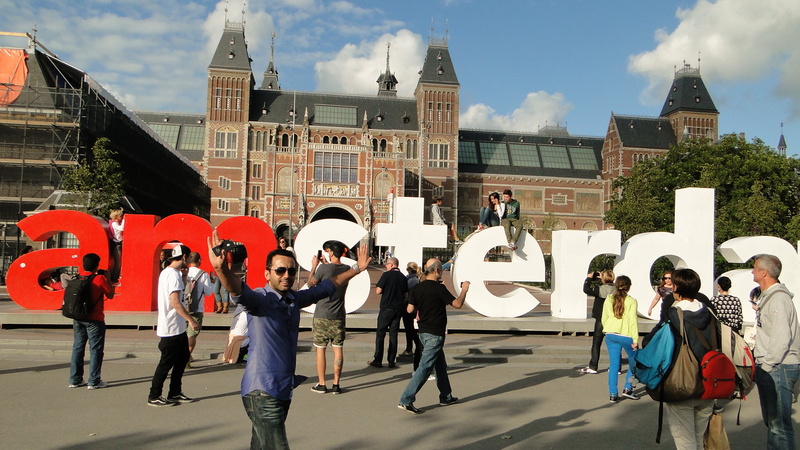 If that weren’t enough, you can climb up the giant letters “I AMSTERDAM” (aren’t they clever?) for a fun, interactive photo opportunity to proudly announce your destination. Back through the tunnels, an accordion player, and a violinist sing gloriously into the acoustic, makeshift bike-drive-by concert archway. I would have paid either of the buskers to watch them in concert, they were that good. Stay tuned for more of my Amsterdam bicycle journey.